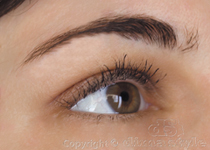 The permanent makeup ia a type of cosmetic tattoo with mineral pigments. 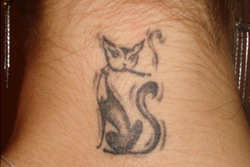 This tattoos will lest for several years and will change the outlook of your face. How Long does the make up lasts? The light colors will last shorter than the dark ones. The usual term is from 2 to 5 years (but must be rettatood). How I will be feeling after the procedure? Right after the color will be more intense, and become faded for about a week. During the procedure a local anesthetic will be used, making it painless. Can I use a make up? Are there any side effects after the procedure? If you are predisposed to herpes there is a possibility for its activation. You save everyday time for usual makeup. You look great 24 hours per day. Makes you confident, gives you the safety and calmness feelings when swimming or in the beach and etc. Saves time and money - the result lasts several years. Price: from 160 BGN to 250 BGN depending on density. The dermopigmentation method is successfully used for a different cicatrix disguises all over the body. 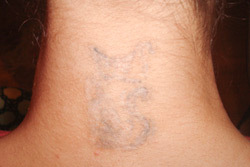 As an example a scar close to the breast nimbus after operation or hyperthrophy correction. 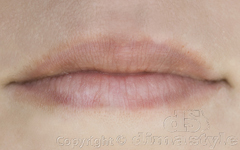 Permanent makeup and tattoo removement. Price: 250 BGN for the first visit, 125 BGN for the second.